Make up by Karmen Cosmetics, custom top/cape by Aya Designs Global, both Black women owned and operated New Orleans based businesses you should support. 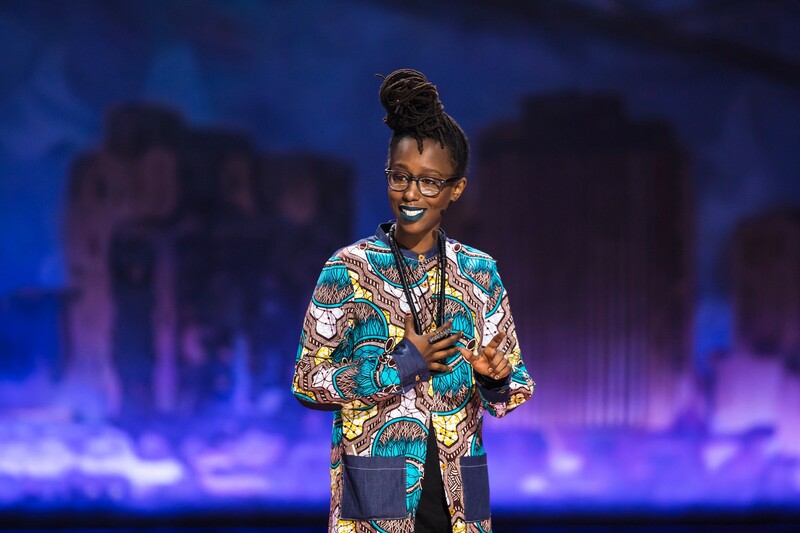 On Sept 27th, 2017 I received an email from TEDWomen inviting me to share my poetry at their upcoming conference. The conference was themed ‘Bridges’ and featured 6 sessions — Build, Design, Connect, Suspend, Burn and Re-build — with each session featuring a 4–6 minute performance by a poet. As someone whose activism and organizing work is rooted in art and creativity, I decided to share a piece I felt most concretely illustrated my connection to the work on and off the page. I chose to perform a piece I wrote 3 years ago called “The Joys of Motherhood”, a piece about Black maternity in the United States, and do a brief talk about how writing that poem allowed me to see how necessary art is in creating connections and facilitating understanding in popular education and movement building spaces. Picture of a human being often mistaken for a human jukebox. On Nov 2nd, I attended an in-person rehearsal where I read my talk from my phone, then ran my poem in front of a small audience I assumed was with the TED team. And this is where my generally positive TEDWomen experience took a turn. After finishing, I went backstage only to notice the curator of the conference walk up behind me. 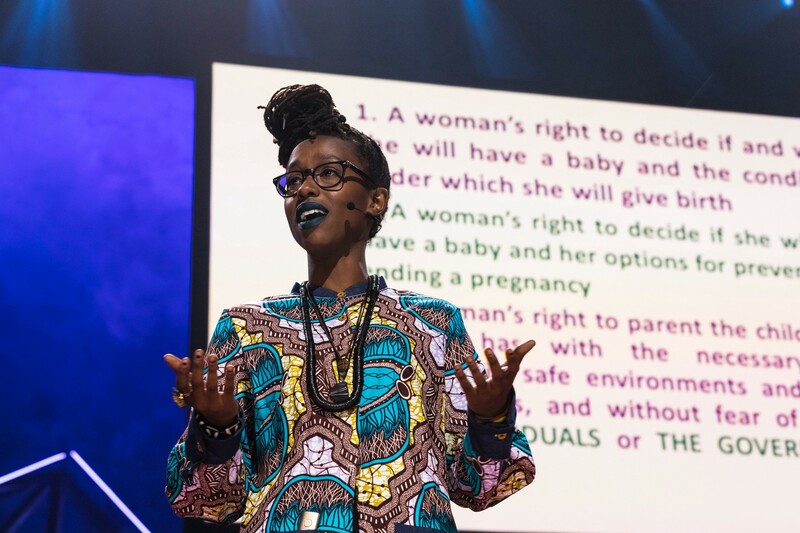 She informed me that there had “recently been 2–3 talks on the TED platform about ‘Black Lives Matter’”, and suggested that I “cut the ‘Black Lives Matter’ portion from my talk” to make it “just be about Reproductive Justice”. People assume that because I am a poet/writer/one who works with words that I always have them at the ready, but her statement caught me off guard. 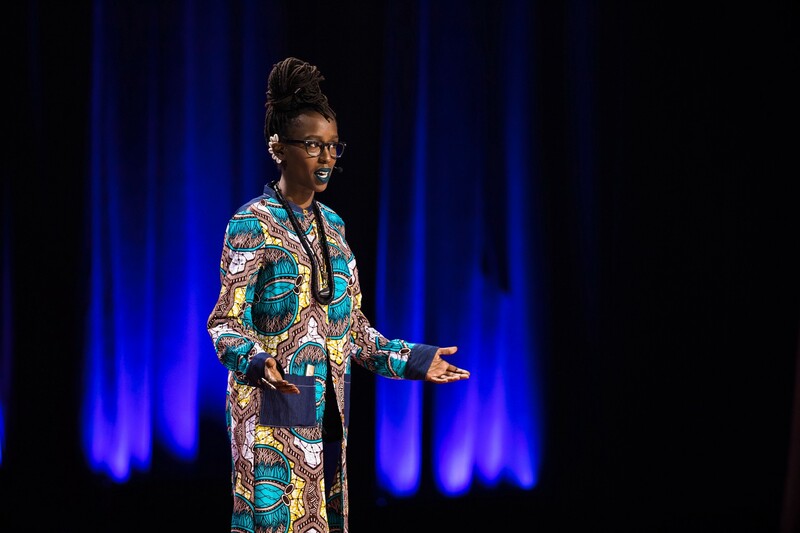 I spat out that I could not cut ‘Black Lives Matter’ from my talk, since the foundation of the talk was how the Movement for Black Lives and Reproductive Justice were inseparable for me. It made me question whether she had read the draft I had sent to her weeks earlier, or if she had actually listened to the content of the talk I had recited not more than five minutes prior. I walked back into the green room, a deep feeling of frustration finding a familiar home in my body. I was frustrated that poets had already been given less that the usual amount of time allotted to TED speakers, only to have it suggested that I remove the flesh of my experience to give a bare bones performance. I was frustrated that I had been invited to give a talk on an idea I deemed worth sharing, only to be told that it was not worth sharing anymore because something similar had been shared 2–3 times recently. As if that’s anywhere near enough. As if we should be grateful for the sound bites they choose to hear when it is comfortable for them, even though we are hoarse from shouting these truths daily. As if we shouldn’t demand more. As if we are not deserving of more than they offer. I went from frustrated to furious when my body remembered this wasn’t the first time it had felt like this. That before, I’d been invited to perform on other platforms, only to be asked to ‘cut’ or ‘tone down’ my messages or, ‘just do my poetry’ like a human jukebox. I walked out, unable to breathe the same air of camaraderie everyone else seemed to be filling their lungs and laughs with and set to work rewriting my talk. Fortunately, the moments I feel most isolated and alone are the moments I am reminded I come from communities of care and unapologetic truths. I went back to the hotel and after conversing with some of my people, including the ones who had recommended me to the platform, I expanded my talk to name the interaction I had just had as part of a larger narrative of erasing explicitly Black narratives. The day of the talk, I heard my bio being read and stepped out nervously. As often as people have the assumption that I always have words at the ready, people also assume sharing these words is easy for me. I am human and I find I have fear ready to escape my throat just as often as stories and solutions. But, when I make a choice, I move forward and, no matter how shaky my voice is, I know the foundation of truth I stand on is solid. I began my talk by introducing how I learned about Reproductive Justice through my mentor/boss Deon Haywood while working at Women With A Vision, then went directly into my poem. After the piece, I named my experience during rehearsal and finished my talk, two minutes over the allotted time (and with a slight misquote of Toni Morrison at the end in all of my nervousness. The text I shared of Morrison’s read — In times of dread, artists must never choose to remain silent…There is no time for despair, no place for self-pity, no need for silence, no room for fear” which I shortened in my talk to “In times of dread, artists must never choose to remain silent…there is no time for self pity, no room for fear” -_-). To my surprise, I was met with a standing ovation. I felt a wave of relief, not at the reception of the talk, but that it was over with. And, I felt a sense of pride that I had managed to get through the talk sharing my whole truth, including the fear that often comes with speaking up for myself. I work for and organize with Women With A Vision, a group that fundamentally believes that we need to “Trust Black Women.” A group that sees everyday how difficult this phrase is in practice, despite people’s best intentions. That night, I was reminded of this reality outside of my workplace. I had just given a TED talk that named my experience and the immediate reaction I was met with was disbelief and denial of my reality/experience. I told the woman from TED she didn’t have to ‘imagine something like that could happen,’ because it had already happened and I had described it mere minutes ago to an audience that included her. Cowry shell ear cuff (or as my roommate calls it, my ‘African bluetooth’ because, you know, you gotta communicate with your ancestors somehow in the 21st century…) made by Dovie’s Divine. At the final speaker gathering, I met with the woman who had suggested I cut my talk in private. 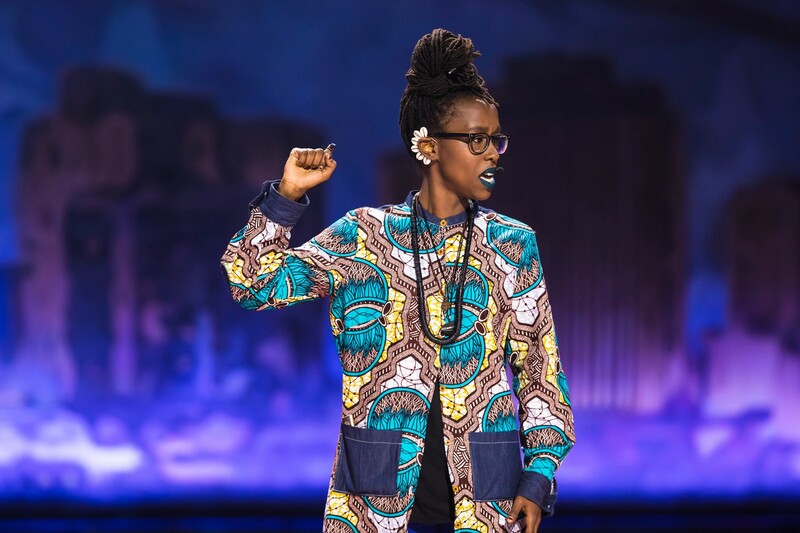 The first thing she said to me was that I had ‘really misunderstood the intentions’ of her comments so she wanted to explain them to me because she believed ‘intentions were everything.’ She told me that she’d previously ‘given’ the TED platform to ‘Black Lives Matter’ speakers when ‘no one else would’ because the movement was important to her. I found myself again momentarily frozen by her words. I grew up with a mother who liked repeating the oft quoted saying, “the road to hell is paved with good intentions.” Throughout my youth, I would hear her say, “to hell with good intentions” (which is actually the title of a speech I read when I was quite young due to my moms teaching). I couldn’t understand how she could be so dismissive of people’s intentions when she herself was one of the most well-intentioned people I had ever met. But eventually, I began to realize that my mom wasn’t just well-intentioned with respect to her goals, she was also careful in making sure that her intentions aligned with the impact that those who were impacted wanted. And if they did not, then something needed to be changed and reparations made to rectify the state of injury. 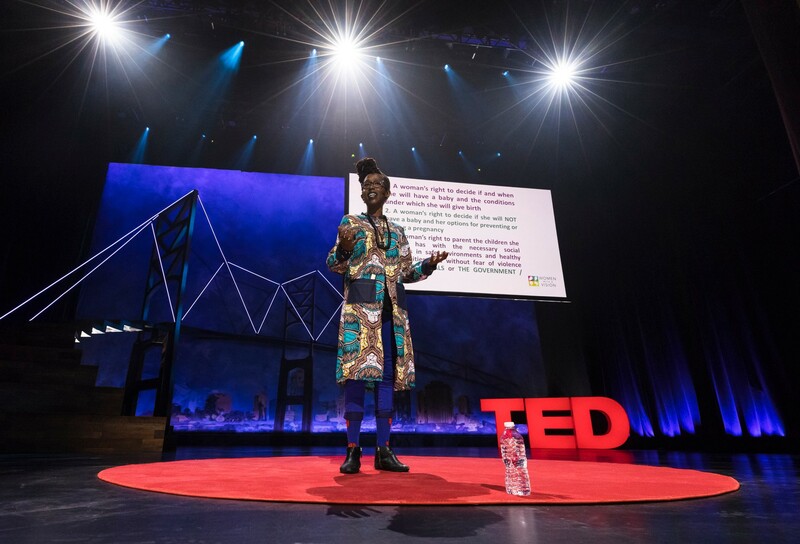 When I heard her say this, I was taken aback that someone tasked with coordinating a large-scale event such as TEDWomen had apparently never considered her intentions may not be enough (or even something to take into account). I told her that I didn’t think she said it with ill intentions, and yet, intentions matter less and less when they diverge from the impact and when the impact itself is denied in the name of honoring the purity of intentions. After some other words, she told me I’d given her something to think about (intent vs. impact), and that she was appreciative that she was able to share her truth and intentions and we left on a cordial note. In terms of intent vs. impact, I’m not sure what the impact of my talk will be. My intention was and is always to honestly share my story and increasingly, to be honest about the struggles I sometimes have sharing it. I’m often painted as someone who speaks out ‘naturally’ and unapologetically. But, unapologetic doesn’t mean unafraid or inherently brave. Unapologetic doesn’t mean I don’t question myself constantly. Unapologetic doesn’t erase my shyness and anxiety after I say or do something that unsettles me, then have to follow up with people afterward with no time to check in with myself. I wish I could say speaking out or up is easy, but it’s not, especially when you find yourself the only one having a particular experience or understanding of an experience. It can be exhausting and often isolating, even (…actually…especially) if people support your message from a distance but do little to nothing to work alongside you; if they want you to be the “first domino” but refuse to ever fall themselves. Paying homage to Toni Morrison’s call for artists to ‘never choose to remain silent’ I ended my talk the same way I am ending this post. By naming the reality of how I move in the world. That every time I speak out, it is because I am making a conscious choice to do so. I made my choice during the TEDWomen conference. And, I am always choosing.